I'm in the process of moving from dual-screen desktop to laptop & external screen, and thanks to Windows 10 I'm having great difficulties with display scaling across various apps, but especially PHPStorm (10.0.2) with monitors of different resolutions / densities. The main display is a MBP running Windows 10 and is 2560 x 1600 @ 175%, with the external monitor 1920 x 1080 @ 100%. Move it to the external monitor, and it goes blurry. Not just the IDE text, but all labels. Whatever I try seems to be a tradeoff - one will look fine but the other will look awful. Is there a solution to this? I'm about to throw the laptop out the window and go back to my desktop! Thanks, I added my thoughts there. Although JetBrains will ultimately be responsible for making this work, very, very few of my Windows apps seem to work on a mixed DPI screen setup. It's extremely disheartening! FWIW, anyone else reading this - the setup I have found DOES work for me is to disable my laptop screen and run TWO 1920x1080 screens, that way there's no mix of DPIs to f*** everything up and it's like working on a desktop. Meanwhile, JetBrains, many developers would be very grateful if you would please still attend to this issue! I am having the same problem with WebStorm and it drives me crazyyyyy. I am using Surface pro 4 (2736*1824 200% scaling) and 2 external monitors with 1920*1200 100%. it shows pretty good on the surface screen but blurry on the external monitors. It looks I managed to fix it in Windows 10. Go to the shortcut of IntelliJ > Right click > Properties > Compatibility tab. The Settings section shows a checkbox "Disable display scaling on high DPI settings". Check or activate it. There you go. This fixed it for me. I have same problem that @Ning and @Dave. Currently, there's nothing much you can do about that, unfortunately. The issue posted by Elena is the key - please vote if you haven't done this yet. For what it's worth, intellij will look sharp on the primary monitor active at the time of windows sign-in (on windows 10). So, you can get it to look sharp on any monitor, but you need to sign out, use windows+P to change which monitor is the active one, and then sign in again. Additionally, it may be necessary to switch font sizes to match the screen's dpi. It's a pain, but a good enough workaround in my case. I'm having the same issue, but only when using the version 15 of any IDEA's products. Using the version 14 the font is crystal clear. I'm using Windows 10 in a external monitor 1920x1080, which I selected as my main monitor (my laptop monitor is 2160 x 1440). Does anyone have a fix for this? I've selected the main monitor as my external monitor but the problem continues. Miguel, that's antialiasing, you can disable it in Settings | Appearance & Behavior | Appearance. The problem is that the fonts without antialiasing look very bad as well. My theory is that there's something that was added from version 14 to 15 in JetBrain's products that make the fonts look horrible in my monitor with antialiasing. Is there anyone with this problem that knows how to solve it? EDIT 1: I suspect this might be related to font rendering in Java. I found this (https://wiki.archlinux.org/index.php/Java_Runtime_Environment_fonts), and I started changing the "Dawt.useSystemAAFontSettings" in the vmoptions inside the bin folder. Could anyone give me any feedback on this? I'm the OP, and you know what solved it for me? Zeroshcr 's answer solved it perfectly. Thanks a lot! Zeroshcr 's answer solved it for me too, although the checkbox label has changed slightly, and I had to select "System". My Notebooks has a HDPI display, my external monitors do not. Right-click on the shortcut of the app you’re having an issue with. 3 most effective way to fix the problem is by using the XPExplorer – Windows 10 DPI Fix which is available for free. 3 – choose your scaling level . I just updated pycharm and I'm back to square one. Before, I had checked to "Disable display scaling on high DPI settings" in Windows, but then the font became tiny. So I added `-Dsun.java2d.uiScale.enabled=false` to the VM options based on this article, which also fixed the size issue for me. Today, pycharm updated and all of a sudden the VM option did nothing and the everything became tiny again. So I do disable the "Disable display scaling on high DPI settings", but now my fonts are very blurry looking and not sharp on my second monitor. My main monitor is 4k, while the external is not. My setup is that I have a laptop attached to two external monitors. I closed the lid and had it so as long as the laptop was connected to power it would still output to the external monitors. I noticed that WebStorm was fuzzy on one of the monitors. Joeri's answer above fixed it for me. I just logged out while the laptop lid was closed but still connected to the two external monitors, logged in, and restarted WebStorm. Beautiful now. Definitely experiencing the same issue as is stated above within Windows 10. My new laptop has 4K resolution, but my external monitor doesn't. The above comments pointed me in the correct direction, but did not fully resolve my issue so that I could correctly view the my IDE correctly on both the external monitor AND the laptop screen. From within Windows, right mouse click on the Intellij short-cut icon (or Android Studio icon). I've got a 1920x1080 laptop screen scaled to 125% and a larger 1920x1080 24" screen scaled at 100%, connected via HDMI on Windows 10 Enterprise. The mentioned solutions only work partially. 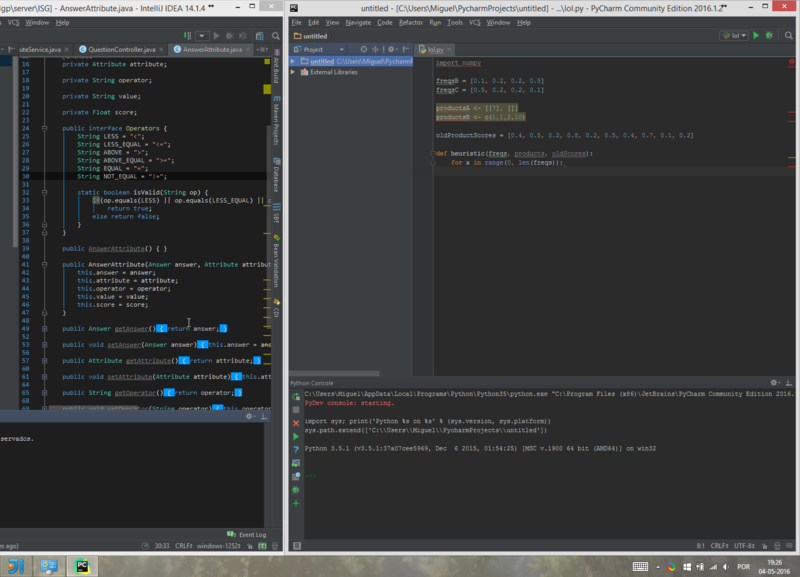 By default, IntelliJ looks crisp on the laptop screen and blurry on the larger monitor. This solution works only partially. It becomes crisp on the monitor, but blurry on the laptop screen! So if I am working on my laptop I have to change the compatibility property of the shortcut again. This solution with System (Enhanced) does not work for me. It displays crisp on the monitor, but then on the laptop it just breaks down. The GUI becomes all corrupted, not rendering properly, with buttons and panes misplaced. I know this is a general Microsoft issue, even Office applications are suffering from this in certain cases. I know Chrome and Visual Studio Code don't suffer from it though. So there must be something the software could do. Issue seems to be fixed in the current version. Tested with JetBrains PhpStorm 2018.3.5 and it didn't work on an older version of 2017 I've had installed before.